Secret Bothy’s location is exactly that – secret! 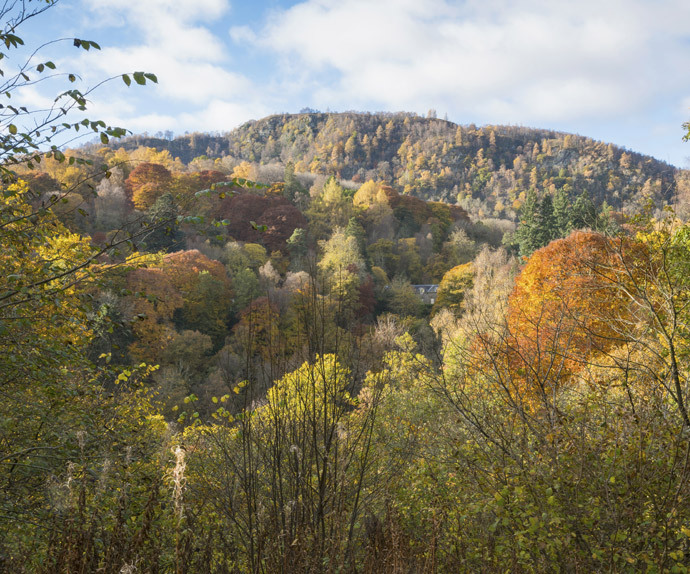 It is not visible from any public road and is accessed by a short, steep private drive somewhere in Killiecrankie, an area of outstanding natural beauty and site of a significant Jacobite battle. It lies just within the southern tip of the Cairngorms National Park. Guests are given fail-safe directions on booking. Killiecrankie, meaning “wood of aspen”, is midway between the Victorian town of Pitlochry, 4 miles to the south and the historic village of Blair Atholl, 3 miles to the north. Bisecting the area, the River Garry has created the Pass of Killiecrankie, a magnificent deep gorge. The immediate landscape is framed by rich wooded uplands, a perpendicular wall of rock, overhanging heather-clad summits and the lofty landmark of Ben Vrackie. At 2,757ft this peak does not quite reach Munro status but there is no shortage of higher and more challenging mountains in the vicinity. The first and possibly goriest of Jacobite battles took place in Killiecrankie in 1689. The Highland Perthshire area of Blair Atholl, Rannoch and Pitlochry has a rich historical, cultural and natural heritage. There are opportunities to spot not just red squirrel and roe deer but also the more elusive pine marten or otter. The semi-natural ancient woodland supports a profusion of birdlife including buzzards, great spotted woodpecker and tree creepers while the River Garry encourages heron, kingfisher and oystercatchers. Salmon swim upstream in the autumn. Killiecrankie lies close to the A9, the infamous trunk road that connects Inverness and Perth. Aviemore is about 50 miles north and Perth about 30 miles south. A railway line shadows the A9 for the most part. There are railway stations in both Pitlochry and Blair Atholl and the daily service both north and south is good. Not only are there frequent trains to main cities daily but the Inverness – London (and return) sleeper stops at Pitlochry and Blair Atholl 6 nights and mornings per week. Three airports at Dundee (52 miles), Edinburgh (71 miles) and Inverness (87 miles) provide useful national and international connections. Car hire is available at all of them. Wheels, of some kind, are essential at Secret Bothy. The Killiecrankie Hotel with its inviting restaurant and bar is within easy walking distance and well worth a visit but the nearest food shops are a few miles away. Car hire is available locally. If you would like to be collected at the railway station, please request so when booking.